Prepare for IELTS and know your tentative test-score through our post-course series of mock tests to give you the IELTS-like feel. The trainer is expertise in all domains and overall guidance will be provided to overcome difficult modules. If you believe that the best education is received in classrooms and want to attend IELTS Coaching in Hyderabad, our classroom IELTS Training program is the best you will find in Hyderabad. Geared to give you the best preparation before your IELTS test, our batches are restricted to ten people. We believe in keeping the batches small, so that our trainers can attend to your personal needs and help you improve better. Our four weeks intensive course includes not just explaining you the test and give you methods of scoring in the four sections of the IELTS test: Listening, Speaking, Reading and Writing, but we also make sure you practice enough on the runtime. Our classes are 2-3 hours long where you get to understand the test, how to approach it and practice in front of the trainer and get feedback on the go. Each week of the training focuses on one language skill of the test and in case you need more than that, you can always contact the trainer for extra classes. Towards the end of the course, you are to take three mocks which will give you a tentative score of your real IELTS Exam. Our trainers are also ready to provide free assistance post the one month period for any number of days till you feel confident to write the test. With an on-the-go trainer assistance and loads and loads of practice and tests, a high band score is guaranteed. We will also guide you through the test registration process. With the world becoming a smaller place, taking the IELTS test is the need of the hour. More and more people are going abroad to settle down or study by writing the IELTS test. Prepare for the IELTS test with our experienced trainers and we guarantee you the best possible score. Our Best IELTS Coaching in Hyderabad gives you the right environment, push and strategies to crack IELTS at one go. Our methods are proven to give you high scores. We pursue each of the four modules of Listening, Speaking, Reading and Writing for one week each. At the beginning of each week, we take a test for you to have a real experience of how each section looks like and for us to know which areas need how much of focus. This is followed by introducing our methods and getting you habituated to those. We finally give you all the tips and techniques to score the best. At the end of the module, we assess you again through a test to check the improvement and look for areas for polishing. The final mock tests are aimed to get you habituated with the test environment and time restrictions and to give you a real-time feel of the IELTS test. In case, at the end of the course, you have any queries or require any long sessions, our trainers are always glad to help you score your best. Speaking practice in previous years questions. People who feel more comfortable learning from the trainer face-to-face. Professionals looking for a change in the job abroad. Will I get a job after writing IELTS Exam? No. This course is just to guide you to score high in your IELTS test. The IELTS test score is no prerequisite for any job, but a criterion to obtain a visa for traveling abroad. What is IELTS Coaching Fee? Will you provide IELTS Coaching material? 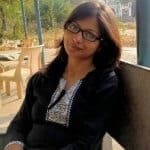 Anindita Choudhury is the lead English Language trainer and Instructional Course Designer for English at PTE Online. With past training experience at the Center for International Education Exchange (CIEE), she is a master in training not just the language but the science behind it. Her passion towards the English language led her towards research in Second Language Acquisition. Her zeal and commitment to teaching magnetized her towards edifying students in the English language. Her interactive sessions and one to one approach during classes make her stand out from the rest of the language trainers.